in the clotting of blood, also known as glass factor and Hageman factor When activated by glass or otherwise to its active form, factor XIIa (EC 3.4.21.38), a serine proteinase, it activates factors VII and XI and converts factor XI to its active form, factor XIa. Deficiency of factor XII results in great prolongation of the clotting time of venous blood, but only rarely in a hemorrhagic tendency; deficiency is caused by an autosomal recessive gene. 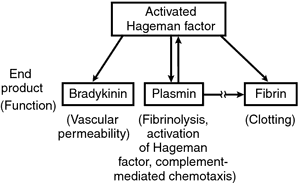 A plasma coagulation factor. When activated by glass or other substance to its active form, factor XIIa (EC 3.4.21.38), a serine proteinase, it activates factors VII and XI and converts factor XI to its active form, factor XIa. Deficiency of this factor greatly prolongs clotting time of venous blood, but only rarely in a hemorrhagic tendency. In blood clotting, it activates factors VII and XI and converts factor XI to its active form, factor XIa. factor XII, one of the blood clotting factors. Deficiency occurs in humans and cats and is asymptomatic.